Last year, producer, composer, musician, mentor and multicultural music emissary Dawn Elder became the first female producer to win the Hollywood Music in Media Award for Best Production. Question: What connects Iraqi singer-songwriter superstar Kazem Al Saher, Nigerian Afrobeat legend Fela Kuti, us television and film star Woody Harrelson, and aspiring teenage vocalists in Santa Barbara, California? 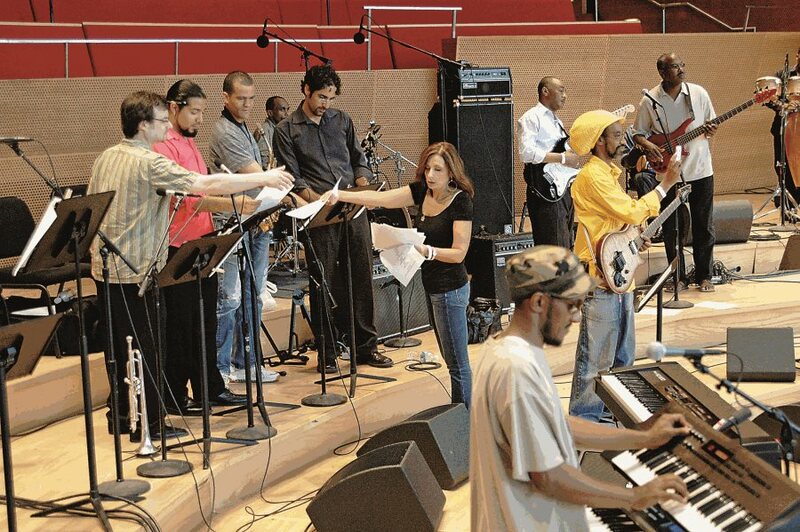 Elder hands out music for a July 2008 show in Millennium Park, Chicago, that reunited artists from Sudan and South Sudan, accompanied by the African Birds and members of the Chicago Symphony. The answer is leading me down State Street, the main drag of Santa Barbara, her hometown and business base an hour-and-a-half’s drive north of Los Angeles. From here, for nearly three decades, Dawn Elder has promoted and mentored musicians, recorded albums, arranged collaborations and organized concerts that have opened American ears to new music from the Arab world and beyond and brought fruitful exchanges among popular, creative performers from dozens of countries. As we walk, she explains how, as a producer, she put together Al Saher’s 2000 album, Al Hobb Al Mustaheel (The Impossible Love), his first and only US-label release; how as an organizer, in 1989 she brought Kuti to play at the Santa Barbara club she ran for a performance the local newspaper declared the concert of the year. As for Harrelson, she managed his brief music career, even going on the road with his band, Manly Moondog, before Harrelson turned to full-time acting. 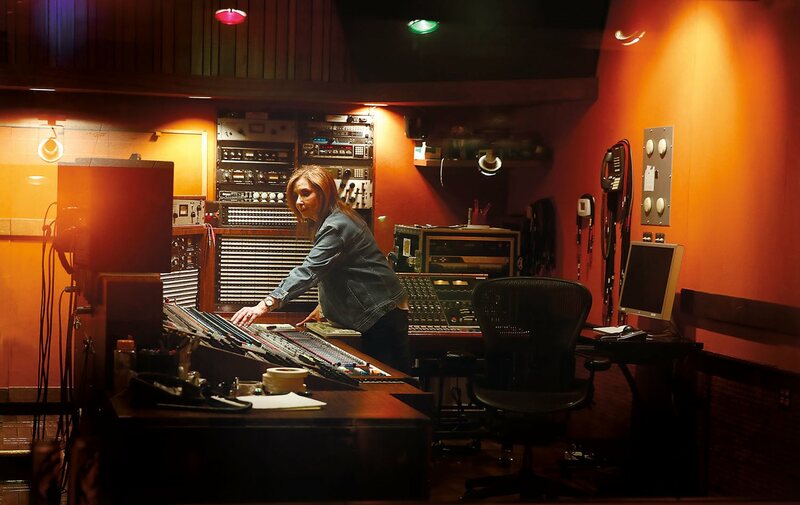 The teenagers are, she says, a mentoring focus, since her founding in 2015 of the Ultimate Vocal Music Summit as a nonprofit that brings together young singers and songwriters and celebrity mentors from the high echelons of the la scene. From top: In 2000, Elder brought Wadih al-Safi and Sabah Fakhri together for The Two Tenors of Arabic Music. 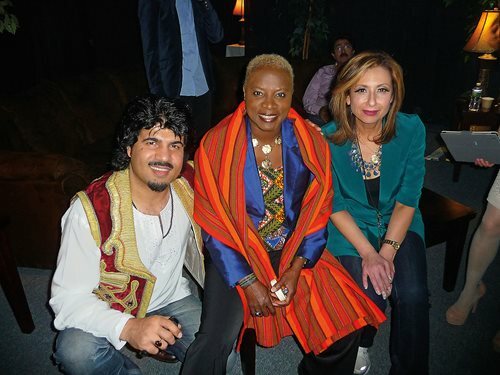 In 2012, she served as a co-producer and songwriter for the One World concert in Syracuse, New York, that brought together Afghan-born rubab virtuoso Homayoun Sakhi and renowned Beninese singer/songwriter Angélique Kidjo as well as some 30 other musicians and the Dali Lama. 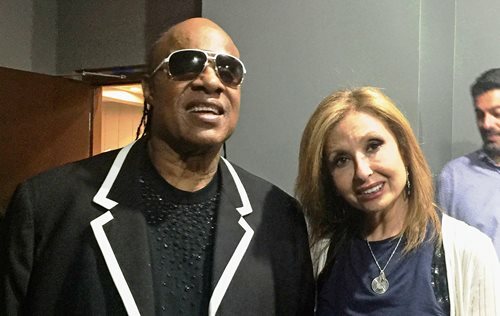 In 2016 Motown icon Stevie Wonder was among celebrity artists who helped mentor young singers at her Ultimate Music Vocal Summit. 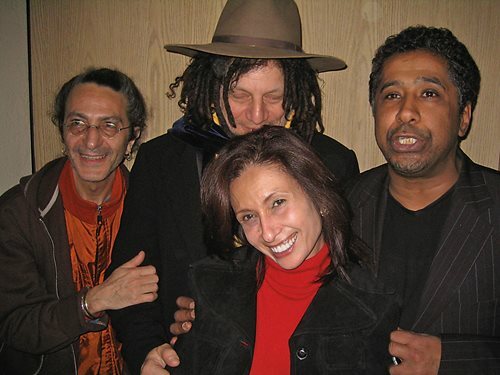 In 2004, she co-wrote and produced “Love to the People” for Algerian Rai star Cheb Khaled(far right); Khaled’s full album, Ya Rayi, featured additional collaboration among Elder and the late electronic pioneer DJ Cheb I Sabbah, left, and producer Don Was. We’re on State Street, though, because her mind isn’t just on music these days. Last year, Santa Barbara was devastated by twin natural disasters that cost the lives of 21 of its citizens and did nearly $2 billion in damages to property and businesses. The Thomas Fire was the second-largest wildfire in modern California history, and it was followed by fatal mudslides. While the direct damage did not reach downtown, the economic and psychological toll is clear as we pass recently shuttered storefronts. Elder shakes her head at each one we pass. It soon becomes clear that this eclectic, fusion-based philosophy guides everything she takes on. When we meet, she is juggling five projects. It’s a typical load. She’s also trying to round up funding for a Peace Through Music concert she is planning for early November in Washington, D.C., that would, like so many of her concerts, bring together Arab and Western musicians to perform on the same stage. There is something deeply personal about her mission. Born and raised in California’s Bay Area and of Lebanese and Palestinian descent, she is at home both in the us and in Arab cultural worlds. Creating dialogues and building relationships through music can help “change the way people see other people,” she says. “I may not talk politics, but I talk music. Everything I want to say is contained in my music,” she says. Although she completed a pre-med degree at the University of California at Berkeley, she added a second major in music and wrote songs on the side. Organizing events and concerts was an opportunity, she says, that “fell into my lap." "Dawn is a unique and indomitable force in the movement to awaken Americans to the music of the world." While at UC Berkeley, Elder had been working at a delicatessen on San Francisco’s Columbus Avenue. When music performers in the annual Madonna del Lume festival (also called “The Blessing of the Fishing Fleet”) “landed right outside my door,” a lightbulb flashed on, she says. She contacted some local bands and invited them to perform at the deli, which soon became known as much for its live music as its sandwiches. A few years later, in 1982, Elder’s new vocation took her to New York, where she worked in catering while making connections among musicians, radio djs, music-label owners, and concert organizers and promoters—all the backstage players who support artists and the business of music. She returned to the West Coast in 1984 when Ventura County recruited her to overhaul three restaurant properties in Ventura and nearby Santa Barbara. Again, she helped the venues book live music. Word of her skill and success reached back to East Coast label heads she had met—Blue Note, Sony, Epic, A&M, Capitol and Universal—and they began sending her new music. She began scouting for new talent and securing radio play. In 2014 Elder worked as a creative consultant and producer with nonprofit sponsor MasterPeace to put on the International Day of Peace concert at Amsterdam’s Ziggo Dome with nearly 40 artists from around the world. Then, as she describes it, she grabbed a chance to run a dinner club in Santa Barbara, quickly earning it a reputation as a top-ranked venue for performers the likes of Wynton Marsalis, Ladysmith Black Mambazo, Fela Kuti, Shawn Colvin, Billy Vera, Taylor Dane, Tony Bennett and King Sunny Adé. That was on full display in 1990 when, at the request of Santa Barbara Mayor Sheila Lodge, she organized the city’s annual Old Spanish Days festival. Rather than stick to a tried-and-true lineup of flamenco and other folkloric music, she booked the Latin-influenced rock of Santana, and for a Scottish twist booked Average White Band. It “literally rocked the boat,” she says with a laugh. 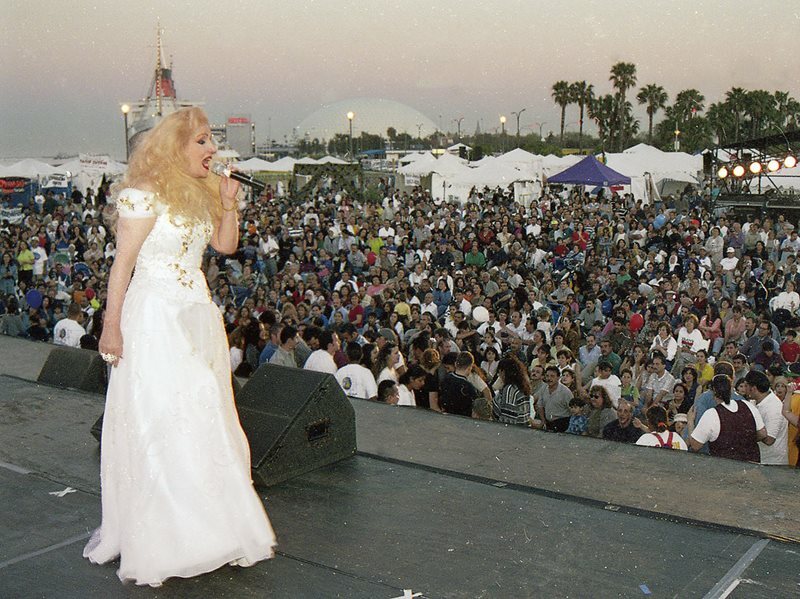 In 1998, Lebanese star Sabah performed at the Long Beach, California, International Friendship Festival. The opportunity came in 1997 when she linked up with Michael Sembello, a Stevie Wonder collaborator who had created a group called The Bridge based on the idea of “writing an album of music that would bridge the world.” But she conceived of it as something even grander: an International Friendship Festival with seven pavilions showcasing music from different parts of the world. 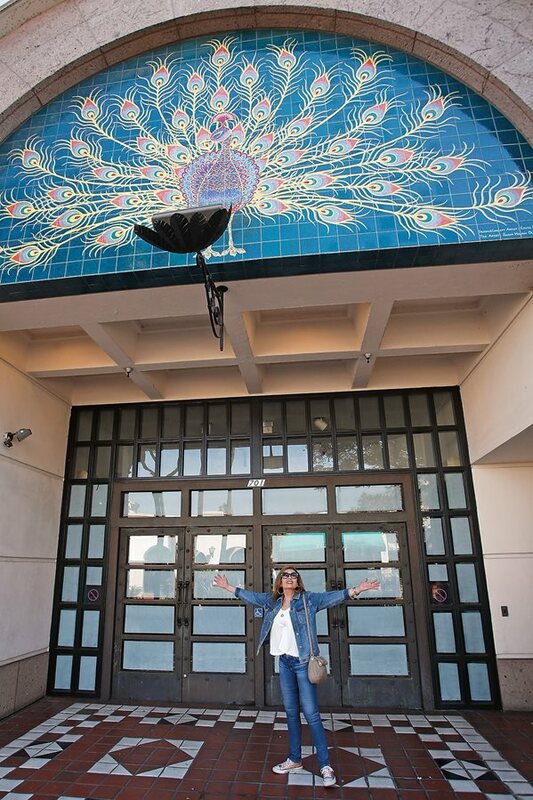 To plan for the Middle Eastern pavilion, she remembered the concert she’d attended with her parents and thought, “That’s the effect I want to create.” She marched into the Lebanese Consulate in Los Angeles and told the startled consul, “I want Fairuz,” she recalls. The consul couldn’t get her Fairuz. But he was helpful, and he introduced her to a Palestinian-American composer and virtuoso on both ‘ud and violin, Simon Shaheen. He became a mentor, a longtime collaborator and a friend—and he helped Dawn meet her superstar namesake, Sabah. "I can't see not helping a young artist or helping foster a culture, or helping create music that will make a difference." This caught the attention of the television company Middle East Broadcasting Center, which in 1998 invited her to organize a festival in Washington, D.C., called Ana Alarabi (I am Arab). She not only set the musical lineup with headline acts from both the famous Lebanese musician and composer Marcel Khalife and the renowned Nubian-Sudanese musician Mohammad Wardi, but she also invited fashion designers, dancers and other artists to showcase the best of Arab culture. born doctor and longtime Wardi fan. The musicians recorded everything at Sunset Studios to capture the synergy and sound of a live performance, but Mohammad Wardi and the African Birds: Longing for Home (Vol. i) and Memories of Sudan (Vol. ii) remain unreleased. After the attacks of September 11, 2001, in the us followed by the wars in Afghanistan and Iraq, “the time never felt right,” Elder says. “It’s a lifetime’s work, and it deserves at least a year of promotion before it can come out.” That, she hopes, will happen next year, perhaps bringing Wardi’s musical legacy to the Grammy Awards. 15-year-old Hailey Silveira is among the vocalists Elder mentors through the Ultimate Vocal Music Summit, a nonprofit that brings young singers and songwriters together with some of the region’s most accomplished musicians and producers. The events of September 11 gave her endeavors a sense of urgency, Elder says. For the next decade she interacted with some of the biggest names in the music business in both the us and the Arab world, orchestrating collaborations between musicians, bringing a hip, positive vision of what it means to be Arab to her audiences and, for the first time, working in the Arab world itself. She also organized Al Saher’s first major US tour in 2003 and produced his first us-label release under Ark 21 Records. In Lebanon, as part of the 2003 edition of the Beiteddine Festival, she linked up Al Saher and Brightman in a sold-out concert under the stars. 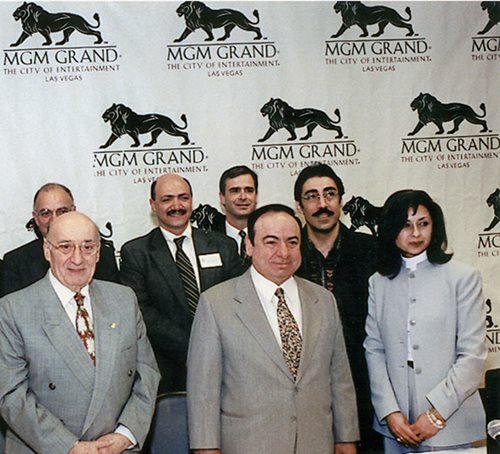 In Las Vegas, she also organized The Two Tenors concert with Wadih al-Safi and Sabah Fakhri, backed by Simon Shaheen’s ensemble Qantara, recorded live and released as an album. In 2004 she worked with Quincy Jones on his We Are the Future concert program in Rome, coordinating the inclusion of world-music artists in the lineup. Later she organized an album, Love Songs for Humanity, and a national concert tour by the Voices of Afghanistan ensemble. That resumé, says Banning Eyre, a music writer and performer who produces Afropop Worldwide for National Public Radio, has earned Elder the reputation as the premier Arab American music producer in the us. Elder hopes this former department store, recently abandoned by Macy’s in downtown Santa Barbara, can be renovated as a music center. “Santa Barbara is a really rich place in terms of its music history, the history of rock ‘n’ roll. So many bands got their start here, or recorded here,” she says. Success as a producer, however, has never come smoothly. She faced pushback on both sides of the world: In the us, she often had to convince promoters that the “unknowns” she was trying to book were really superstars in the Arab world; in the Middle East, she had to convince executives that a woman could do the job she was putting forward. One such project is the Ultimate Vocal Music Summit (UVMS), which she founded in 2015, grounded in hometown Santa Barbara. It takes the format of reality-tv shows such as American Idol and sets it up to maximize benefit to the young artists rather than the show’s owners. Among its sponsors are piano manufacturer Steinway, the performing-rights company bmi and the Orange County School of the Arts. From annual auditions for budding musical artists between the ages of five and 18, 50 are chosen to attend a three-day musical boot camp that includes training in vocal technique, songwriting and music, and stage presence—all the basics of what it takes to become a professional performing musical artist. Parents too receive advice about how to advocate best for their young performer. Out of the 50 kids selected to attend the boot camp, 10 come on full scholarship, and five are chosen at the end for a yearlong mentorship program that culminates in a concert backed by a Grammy-level band. They get the chance “to work with people who have worked with Diana Ross, Stevie Wonder, Michael Jackson and Aretha Franklin, and they are all volunteering their time,” says Elder. At Sunset Sound, Elder prepares for recording sessions planned with Cheb Khaled later in the week. Since the 1960s the studio has recorded not only dozens of music and film-score icons but hundreds of hopefuls—including, in 2016, Ty Waters (Tyson Venegas), then 10 years old, whom Elder mentored as a writer and singer through her Ultimate Vocal Music Summit. And the UVMS, she says, is part of her vision for Santa Barbara too. It’s part of why she wanted to walk me down State Street, especially to the Macy’s department store building, a gorgeous Spanish-colonial-revival construction that now sits empty. “After the fires and the mudslides, I wanted to do something that would help document [the city’s] musical history, create something that would keep the memory alive,” she says. Under one roof, she envisions a center for musical production, both professional and civic, with “cafés and street performances” outside. She ticks up every floor of the building with her finger: the ground floor for studio spaces and instrument shops; the second floor, teaching studios, offices for an independent recording label, seminar rooms, workshops, master classes, a library, a music camp; and on the third floor, recording studios. If her experience is any guide, that is easy to believe. Michael Nelson (www.lifeonthewire.photo) is an award-winning US-based photojournalist who has been based in Lebanon, Belgium, Egypt and the US during his 35-year career. He currently lives in Los Angeles and works for the European Presphoto Agency.